The start of our trip turned out to be quite an experience. The Iberia flight from Chicago to Madrid boarded on time, but the plane sat at the gate for an hour for what we were told was to wait for luggage to arrive. 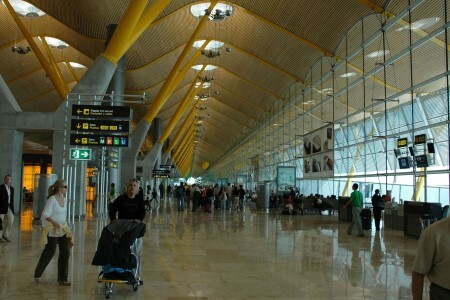 We arrived in Madrid an hour late but Aaron and I thought if we ran we might be able to make the flight. We were wrong. We ran all the way from International arrivals, through the international terminal, past immigration, to a tram, through security, and finally from one end of the terminal to the complete opposite side of the terminal. We finally arrived at the gate huffing and puffing only to find that they had already closed the gate and we would have to wait for the next flight. This gave us some time to relax, freshen up, find an ATM machine, and have some lunch. Unfortunately this threw off our schedule by a bit, but we still had enough time to visit all the places I had planned to see in Lisbon. 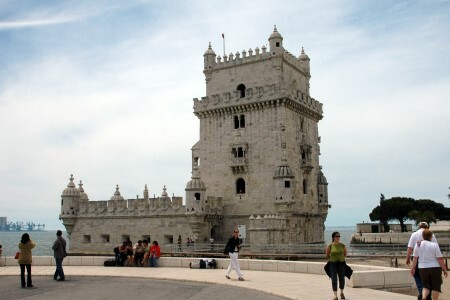 After arriving in Lisbon and collecting our luggage we took a taxi to the hotel where we dropped off our luggage, then took taxi to the Tower of Belém. Taxis in Lisbon are much cheaper than in Chicago, most of our rides took just as long as rides I take in Chicago, but in Lisbon they were about half the price. The cabs also drive very fast down narrow winding roads while changing lanes like crazy. Sometimes it felt like we were on a roller coaster. When we arrived at the Torre de Belém there were a lot of people in the park surrounding the tower enjoying the nice weather as well as a number of boats racing around in the river. Most were 420s and Lasers having a regatta as well as a few cruisers passing through under spinnaker. It was interesting to hear them yelling out starboard in Portuguese to approaching port tackers. We then took a tour of the Tower. 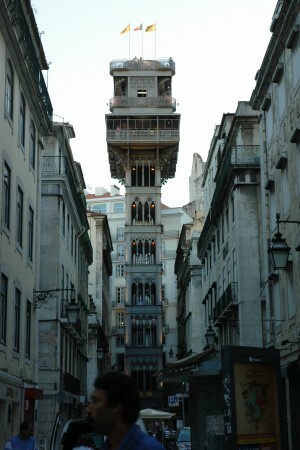 The tower was constructed between 1514 and 1520 in memory of St. Vincent, the patron saint of Lisbon. 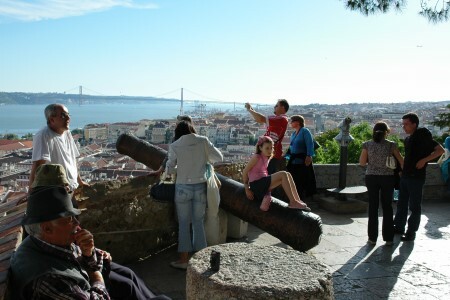 The tower welcomes every ship coming to Lisbon and was part of a defensive plan to protect the northern shore of the Tejo river. 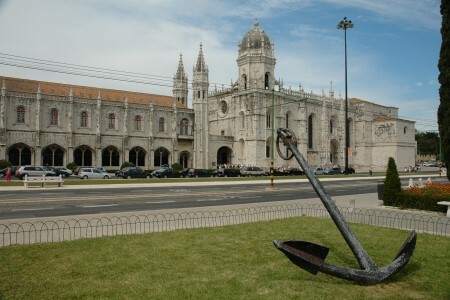 It was placed on the former location of a dock for an armed ship that defended the city. From the tower we walked to the Monument to the Discoveries. The monument is an impressive 50 meters high and was inaugurated in 1960 during the celebration of the 500 year anniversary of the death of Henry the Navigator. 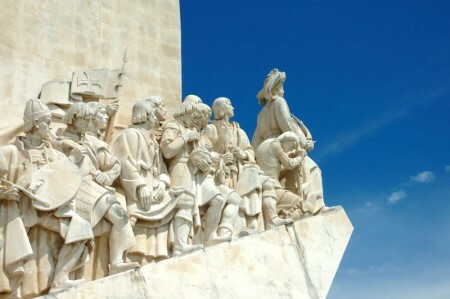 The monument has Henry the Navigator at the front holding a small caravel (a small highly maneuverable ship used by the Portuguese and Spanish for long voyages of exploration) followed by other Portuguese nautical heros such as Vasco da Gama (discovered a sea route from Europe to India), Pedro Álvares Cabal (discoverer of Brazil), Fernão Magalhães (crossed the Pacific in 1520) and many others. 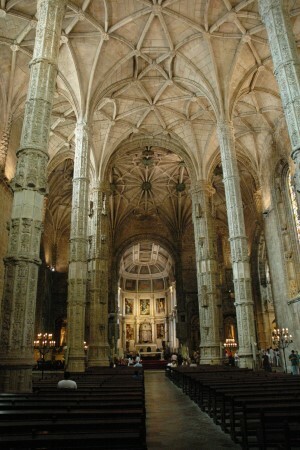 Our next destination was the Jerónimos Monastery which contained the Museu de Marinha. (Maritime Museum) The museum was good, but not great. It contained a large number of statues and portraits of Vasco de Gama who discovered a trade route to India around the cape of good hope at the south tip of Africa thereby avoiding hostile areas in the middle east. In another section of the museum they had models of various ships and other nautical items showing the great nautical power and history of Portugal. 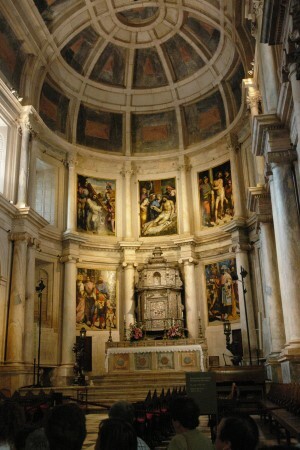 After leaving the museum we walked around the outside of the monastery to the Church of Santa Maria de Belém. The church was very impressive with an incredibly high ceiling and very impressive columns. After leaving the Monastery we made our way over to the National Coach Museum stopping to buy a fare card for the bus on the way. Unfortunately I found out the next day that the pass we bought was only good on the busses and not the subway, so we ended up wasting some money by buying too many passes. 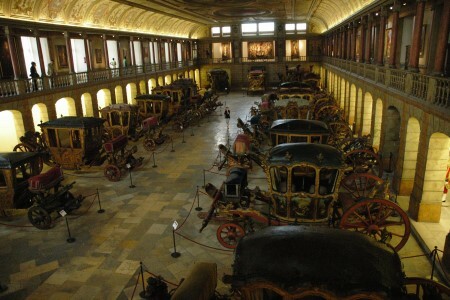 The coach museum houses the largest collection of ceremonial vehicles from the royal family dating from the 17th century to the late 19th century. Personally I didn't find the coach museum that interesting, probably because at this point I was starting to get a little tired, but I'm glad I went nonetheless. From the coach museum we caught a bus to downtown Lisbon. I wasn't exactly sure where we should get off, so when I saw what I thought was Saint Jorge's Castle we jumped off at the next stop. After hiking up a very steep street it turned out that what I had seen from the bus wasn't the castle, but was actually a church. Since we had already hiked up so far we decided to continue up the hill to the castle. Looking back I think we should have caught one of the funiculars up the hill instead. By the time we made it up to the castle we were both pretty hot and sweaty. Luckily the castle is a good place to relax. There were a number of people and families just sitting around and enjoying the pleasant view and a cool breeze. One elderly gentleman was even listening to a sporting event on a small radio. After catching our breath we decided to explore a little bit and see what else was going on in the castle. We soon found a craft fair with a number of musicians and walking a bit further we found the castle itself where there was a stage set up with a band performing as well as a number of booths with people selling various items. Noticing a number of people walking around on top of the castle walls we decided to go up as well and check out the view. From the castle walls we were able to see almost the entire city although at this point my knees were starting to complain about all of the walking I had done. Feeling completely exhausted we hiked down from the castle to the downtown area to find a place for a nice leisurely diner. 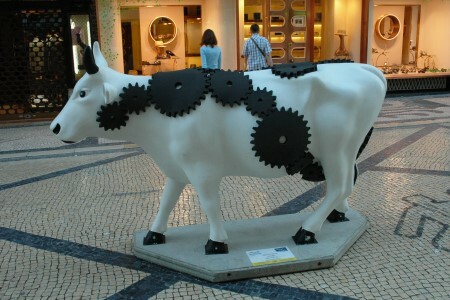 Throughout downtown Lisbon there were lots of cows on display similar to what we had in Chicago. We also spotted the Santa Justa Elevator, but didn't feel like taking the ride up. After walking around a bit we finally decided on a seafood restaurant that looked pretty good. It turned out to be great. Both Aaron and I ordered salmon. When it arrived our eyes popped out of our head. They served each of us a gigantic cross section of a large salmon that was absolutely delicious. After finishing diner we tried to find a Metro stop to get back to the hotel, but when we finally found one it was closed, so we ended up taking a cab instead. All in all, despite arriving later than planned, I don't think we could have possibly done any more in one day.